Outdoor play maintains health and fitness and enhances learning and creativity. Kaplan provides the very best commercial recreation and playground equipment — and the very best custom design and installation experience — for outdoor classrooms. Browse a digital version of our playground catalog here. If you'd like a catalog mailed to you, request one here. 9 - 24 months. 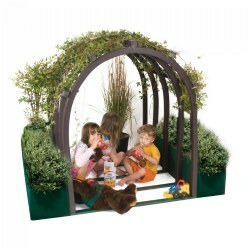 This enchanted unit encourages social interaction and exploration for up to 10 children. It is loaded with hidden objects and play events. Easy to supervise. Size: 6'11" x 8'3". Use Zone: 19' x 21'. Weight: 435 lbs. 9 months - 2 years. 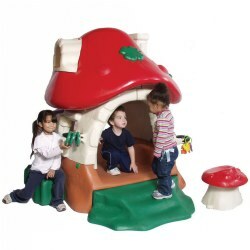 Whimsical Mushroom Cottage comes fully assembled and can be used indoors or outdoors. 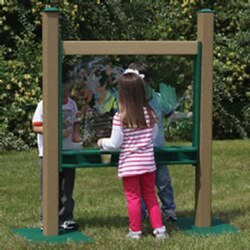 Encourages and develops gross motor, cognitive, and social skills. Includes animal and insect shapes, slide, and a toadstool chair. Capacity: up to 10 children. Size: 4'8" x 8' x 5". Use Zone: 16'8 x 20'. Weight: 270 lbs. 2 - 5 years. 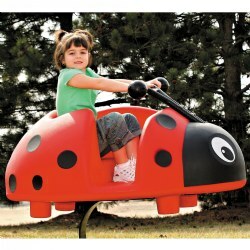 Scarlet the Ladybug is one of the Garden Grubbies Spring Riders collection. Meets ADA guidelines. 2 - 12 years. 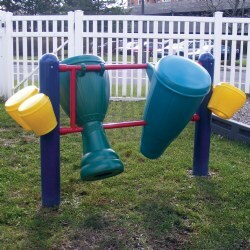 The Beat Club features six drums in a concise layout to minimize space while maximizing children's involvement. The Ashiko and Djembe, both indigenous to Africa, take center stage. The Bongos at each end of the system are said to have evolved from Cuba. Invite toddlers to help "walk the dog" and stay safe while going for a walk. This walking rope features 7 dog characters with a cushioned handle on each side for children to hold. 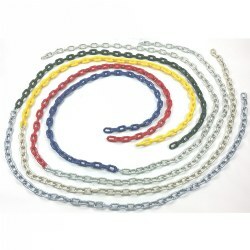 This 14 handled walking rope comes with a zippered vinyl storage bag. Machine washable. Infants & up. Includes pad, rolling hill, tunnel, and steering wheel. Low panels provide support. Rolling hills help develop strength. Wonderful for children who have reached mobile stage. 6 - 23 months. Earth-friendly Kinder Crossing has supports and stairs made from 100% recycled plastic lumber. Features moveable balls, shapes, mirror, bubble window, and an activity spinner. 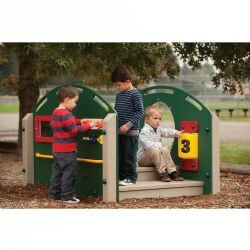 Promotes social and physical play. 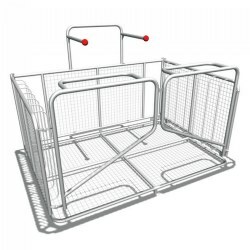 Cruise rail to support standing and walking. In-ground or surface mount. Meets all guidelines of ASTM 2373. 6 - 23 months. Block box ncludes 50 blocks which can be sorted and stored in the box. The lid converts the sorting box to storage. Measures 16"W x 60"L x 16"H.
The Snug Play storage unit holds the elements in a lockable frame that can be used indoors or out. The Mound, Loop, and Cone are landscape elements and are designed to be left in the play space while smaller elements are stored. It is a good idea to develop a system for putting Snug Play away at the end of the day using students, maintenance staff, or play facilitators. Weight: 889 lbs. 2 - 12 years. 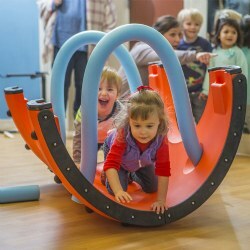 SnugPlay's unique, easy to maintain play components provide open ended, interactive, and inclusive play opportunities both indoors and outside. 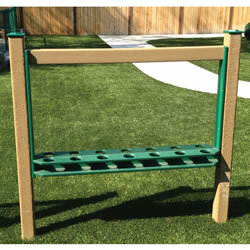 The Advanced system offers a substantial quantity of the Snug Play elements, while taking up less space with a smaller Loop Ring. This system does not include the Mound. Number of children: 40 - 50. Average space needed: 35' x 35' area. Weight: 615 lbs. 2 - 12 years. 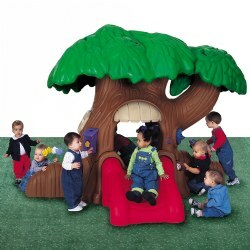 This SnugPlay system compels children to be more active and creative than with other types of play equipment. The Intermediate system is ideal where there is less space available and when fewer children will be playing together at one time. Number of children: 20 - 40. Average space needed: 25' x 25' area. Weight: 500 lbs. 2 - 12 years. This SnugPlay system encourages cooperation and communication as children use their imaginations to assemble creative environments using the loose parts components. 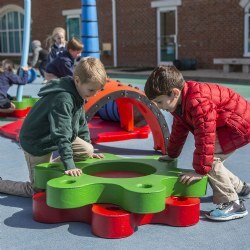 The Elementary system includes a variety of Snug Play pieces that can be used to enhance learning experiences in any small setting. Number of children: 15 - 30. Average space needed: 15' x 15' area. Weight: 297 lbs. 2 - 12 years. 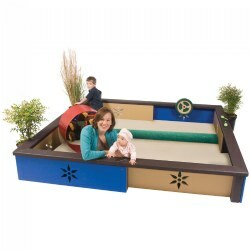 This SnugPlay system is the ideal starter unit to help introduce children to a unique child-powered play event. 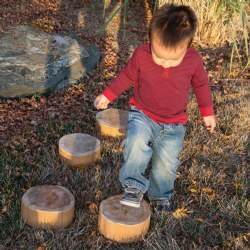 The Primary system provides a modest number of Snug Play pieces that introduces children to the concept of loose parts play in a compact setting. Number of children: 10 - 20. Average space needed: 12' x 12' area. Weight: 161 lbs. 2 - 5 years. 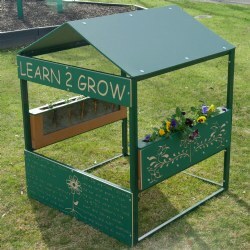 Playhouse includes two rootview planters. Weight: 211 lbs. Measures 48"W x 48"L x 63"H.
2 - 5 years. Includes two mod boxes. Capacity 8 children. Use Zone; 12' x 12'. Weight: 218 lbs. 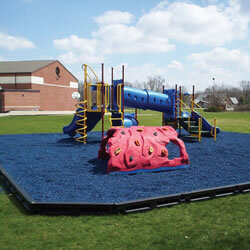 Measures 48"W x 72"l x 48"H.
Playground Border is made from 100% recycled materials. Comes with a patent pending "Surfacing Guide", spike, and 10 year limited warranty. 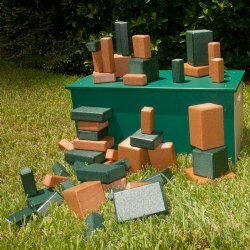 4'4"L x 4"W x 12"H.
Playground Border is made from 100% recycled materials. Comes with a patent pending "Surfacing Guide", spike, and 10 year limited warranty. 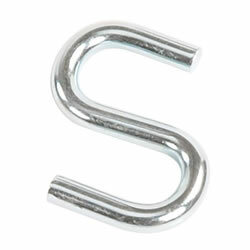 4'4"L x 4"W x 8"H.
3/8" Zinc Plated "S" Hook to use with Vinyl Coated Chain and Galvanized Steel Chain. Vinyl coating easy on the hands, adds comfort and color. Galvanized steel will not rust. Sold individually (not in pairs). Available in 66" and 102" lengths. 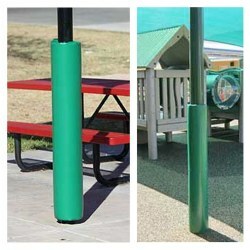 Post pads are 1" thick and 4' high, available in a range of sizes. They have a Velcro® closure. Custom pads are also available. 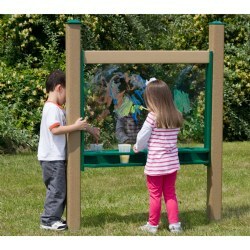 Indoor or outdoor two-sided portable compact 44" washable art easel. 6 - 23 months. Wood Stepping Slices are 3" high. Portable.